I've been following your thread recently, and not only am impressed with your fine work and dedication, but appreciative of the great resource the thread is for us neophytes just starting a Mopar restoration. Keep up the great work. Thanks Gunsmoke. I've been following your adventures with your roadster. Your task makes my restoration look like a cakewalk! 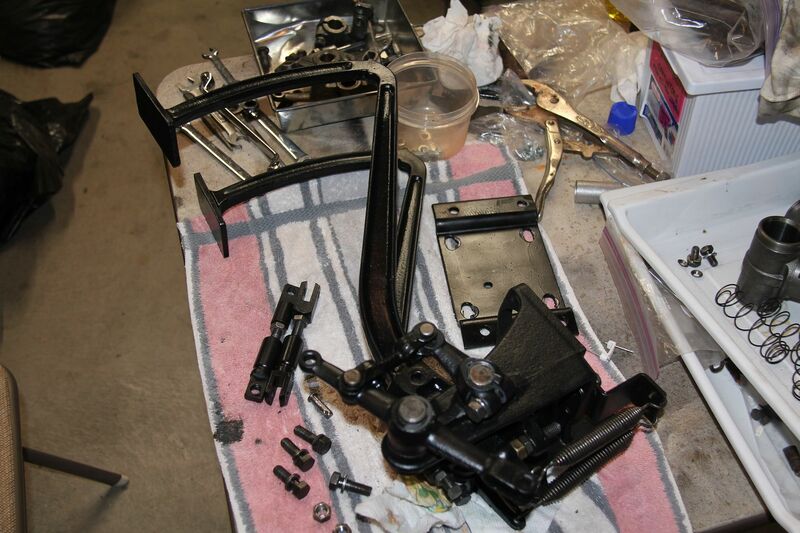 I'm tackling some of the last restoration bits on the frame. Anyone want to guess what this is? I'm sure all you Mopar experts will identify it. 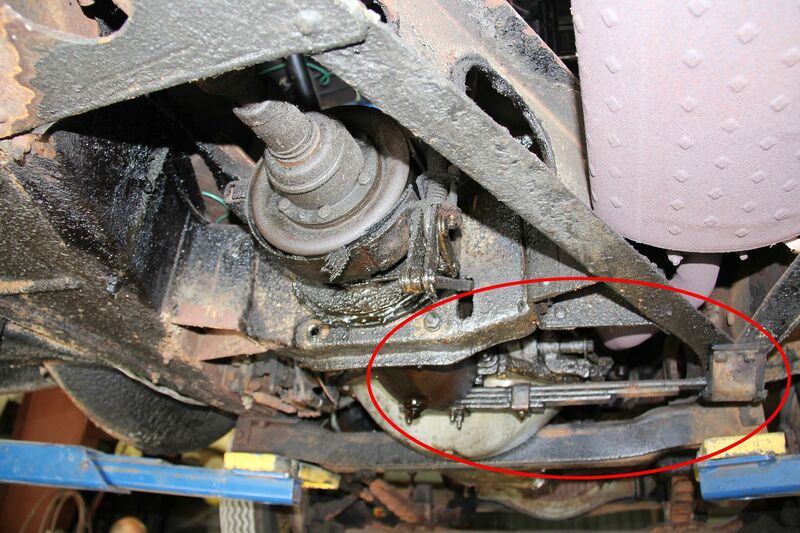 That's right, it's the small leaf spring that runs from the motor to the frame and is part of the Floating Power system. Here it is in all its grungy glory before restoration. 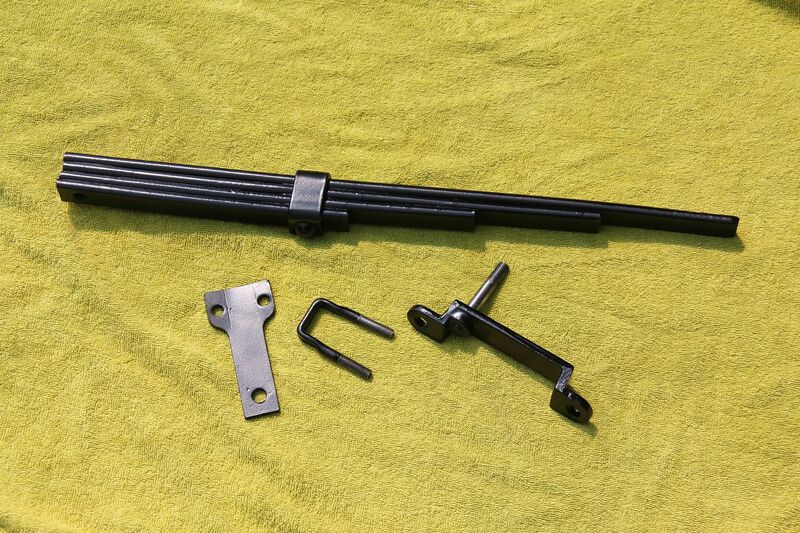 The large end of the spring attaches to the back of the bellhousing, and the spring runs across to the frame where the small end fits into this rubber mount. By the way, those four threaded holes in the frame had me worried for awhile. I couldn't figure out what could go in that spot. 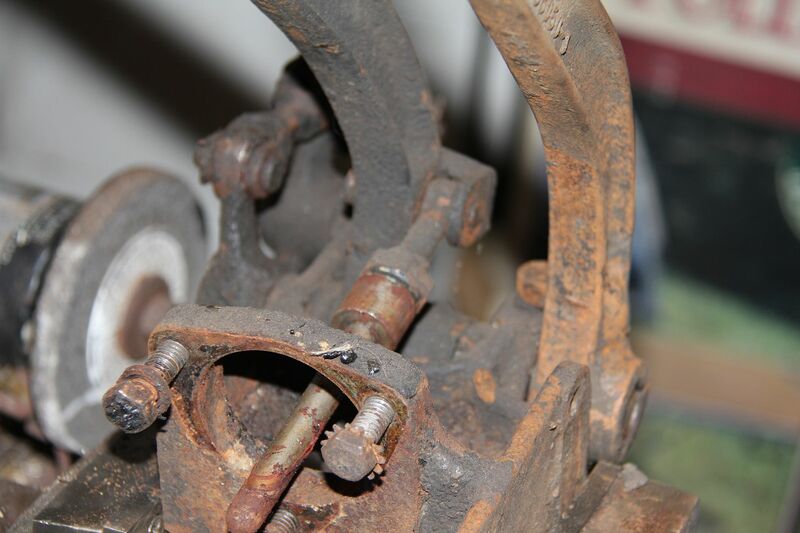 Then I realized they were the extra holes for the pedal assembly on a right-hand drive car. 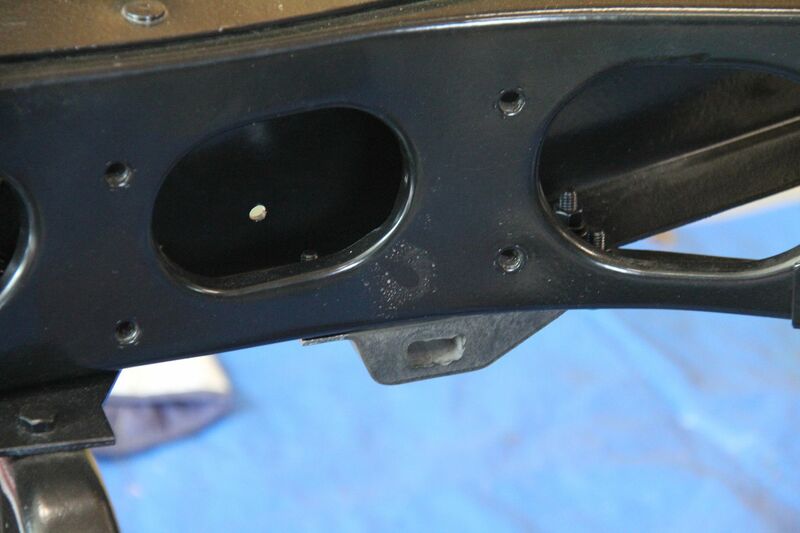 You can see the two large holes in the back of the bellhousing/flywheel cover where the spring mount attaches. Nothing much special about this area, just clean and paint, other than having to have the rubber mount redone as the original had deteriorated into a puddle of muck. 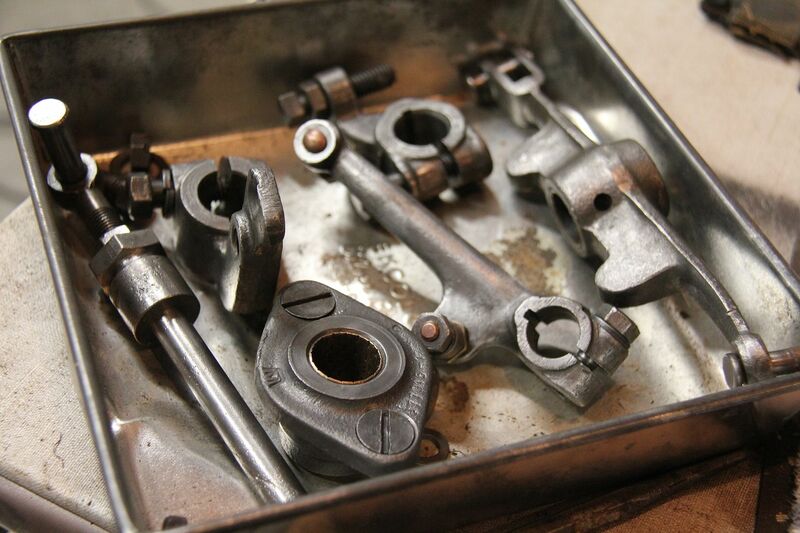 I'm also cleaning up the pedal assembly. Boy is this thing complicated. I'm sure the Dodge Brothers engineers had a reason for all this, but I can't believe there wasn't a simpler solution! It was also a real mess. Lots of nooks and crannies to collect years of road grit. I was careful taking it apart, shooting many pictures and making notes, as getting this maze back together correctly is going to be a challenge. 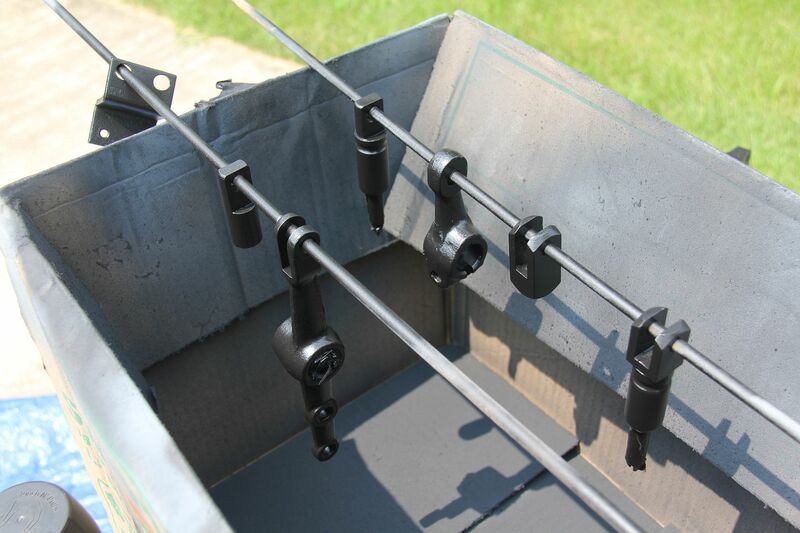 We've all been there - does the thick side of the pivot shaft face toward the casting or away from it? Once I got down to the basic casting, I went to work. It came out pretty good for an afternoon's work. This is just part of numerous levers and shafts that make everything work. Basically very boring stuff. 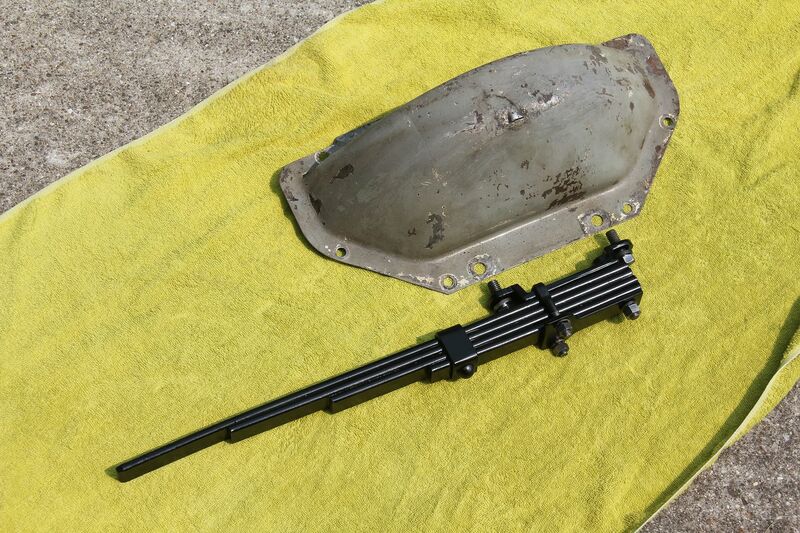 Disassemble, clean, prime, paint, put back together. I'm not sure posting this stuff is worth your time other than making me feel like I'm accomplishing something. Not boring to me! Makes me wish I was in my garage doing the same thing! 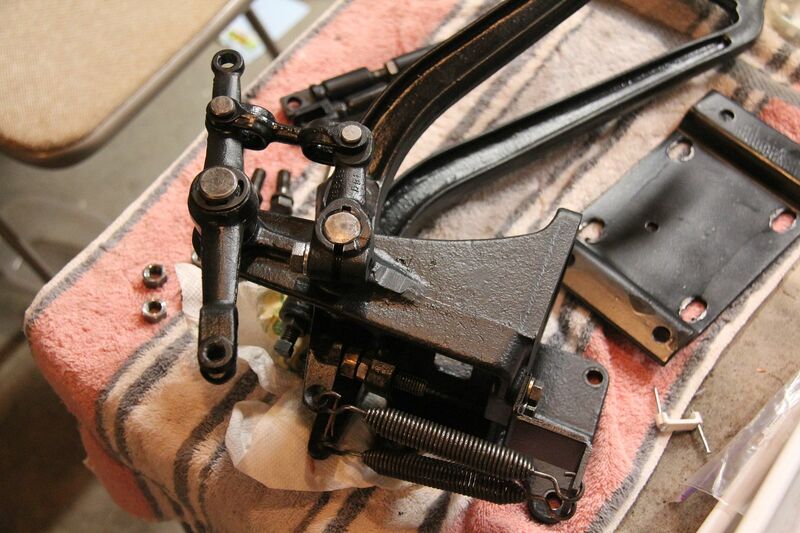 I love seeing all the different aspects of restoration you are tackling and doing such a beautiful job on! 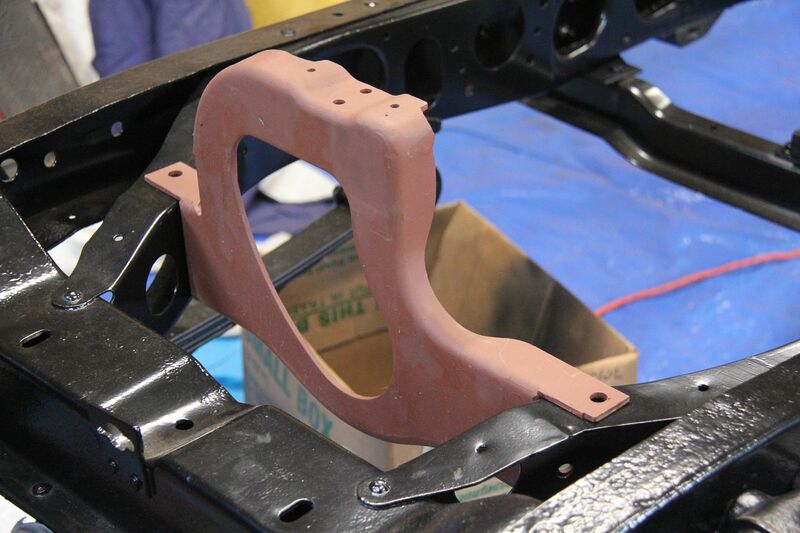 Interesting about the extra holes for the right hand drive cars. I had the same problem only that the extra holes were for left hand drive cars. Still makes you second doubt that maybe you've missed something. I agree, Ian. I guess it was more cost effective to just provide both rather than making individual frames for export and non-export cars. My relined brake shoes are due back any day now and I was wondering which way the shoe with the smaller pad faces? When I took the brakes apart, the longer shoe pad faced the front, the smaller to the rear, is this correct? I am pretty certain that is the correct positioning. Mine are that way on my '31. Both my '33 Plymouth Instruction Book and my '34 Plymouth Factory Maintenance Manual show the shorter lining on the rear shoe in their illustrations. Different make and year but same factory engineers so it sounds like you have it right. But that is backwards of how I'd have guessed, so now I have find some reference that explains their reasoning. At least my shoes were all relined with the same length lining so I don't have to go out and swap all of them. Most articles I found on the internet say that the short pad should face the front. But several people mention that on "older" Chevy, Ford and Mopar, the longer pad faces the front. 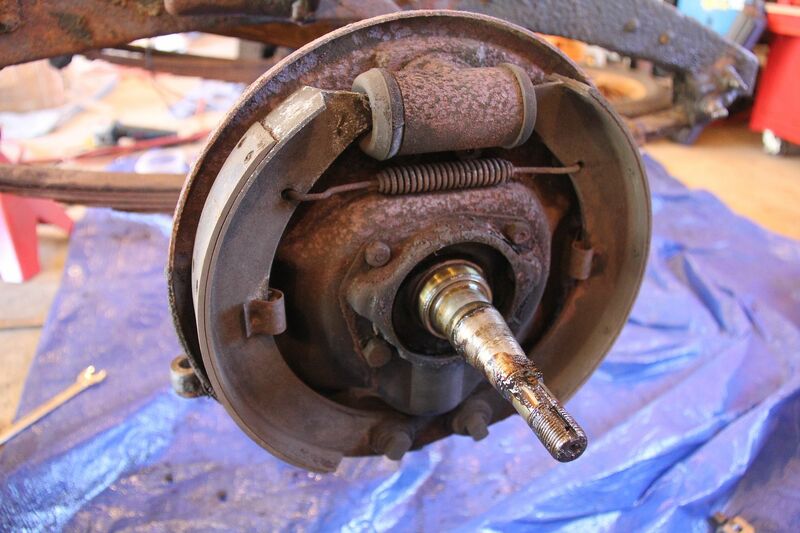 The difference may be due to the more modern "self-energizing" brakes that appeared in more modern cars. I dug out my Instruction Book and it, too, has the long pad facing the front. I'll go with the book. Looking at the '34 Plymouth factory service manual, they give a different heel clearance for the short lining shoe than for the long lining shoe. You might want to check the documentation for your car to see if they were doing that for your car. They are called primary and secondary shoes. I get this theory wrong all the time so take it with a grain of sale. If you think of where the force is when braking the wheel (tire) is slowing against the road, so the force would be against the front shoe as the tire would be pulling against the spindle towards the rear of the car. I may also be argued that the weight of the car would be pushing forward against the rear shoe when the brakes are applied. Regardless of your train of thought I would go with the manual. Well, that article says short lining to the front. I still trust the handy dandy Owners Book. Maybe the Dodge engineers had reasons for what they did. Or maybe they were wrong eighty years ago! Might have something to do with Lockheed style brakes where the leading shoe does not help energize the trailing shoe. The diagram and explanation linked to in that earlier post seems to be more of a Bendix style setup. I have not been successful in finding a period explanation for why Chrysler did it that way. Seems like for equal braking on both shoes you'd have the self-energizing (leading) shoe lining shorter than the non-self-energizing (trailing) shoe. Maybe there is a video training strip about that on the Imperial site. I think the Lockeed angle is the answer. Several articles mention the self-energizing Bendix brakes. I can't find much on the Lockeed style. They're a different animal as all early Mopar fans know! A bit more progress. I have the pedal assembly finished and mounted on the frame. 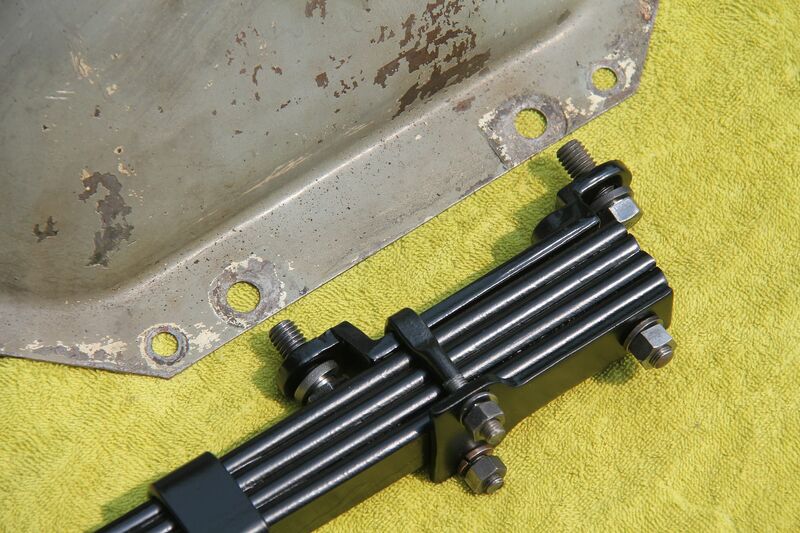 There are several bolts with nuts that are attached inside the boxed frame. I'm not sure how they did it at the factory, but it was a real pain. It's a complicated setup. 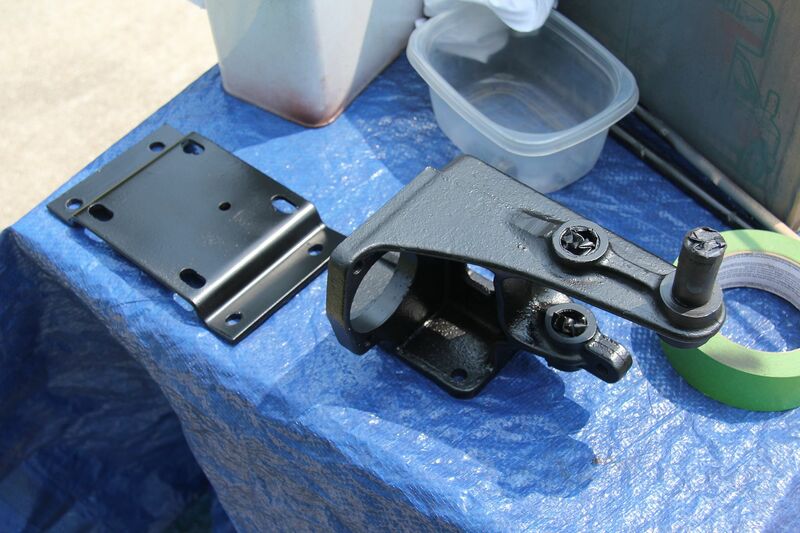 This is the other half of the levers which are to be painted gray as they are attached to the bellhousing and were painted with the engine assembly. 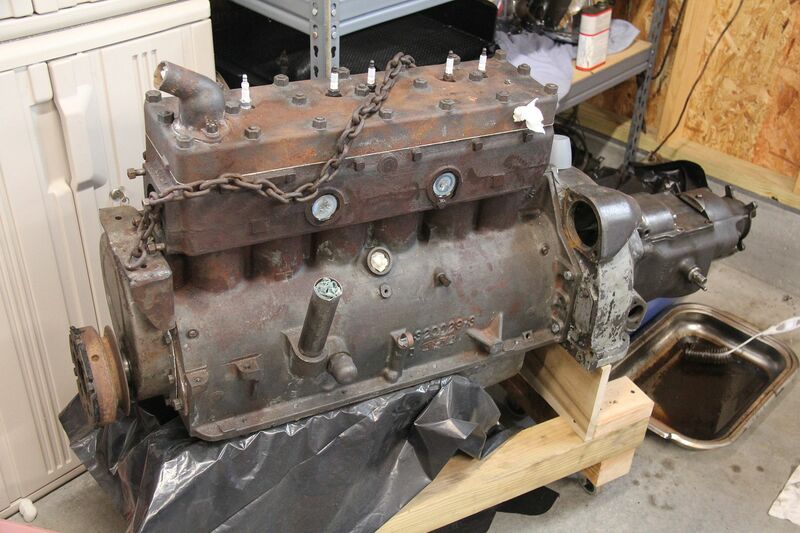 Speaking of the engine, if it ever stops raining I'll wheel it out into the driveway and clean and paint it. 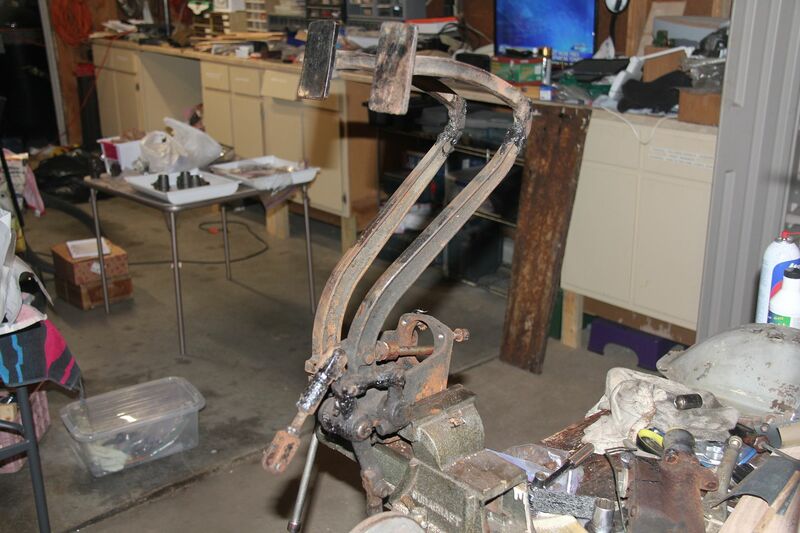 As far as I can tell (from the remains of the old factory paint) the engine, transmission, front mounting bracket and rear mounting bracket were assembled and then painted a greenish-gray as one unit. 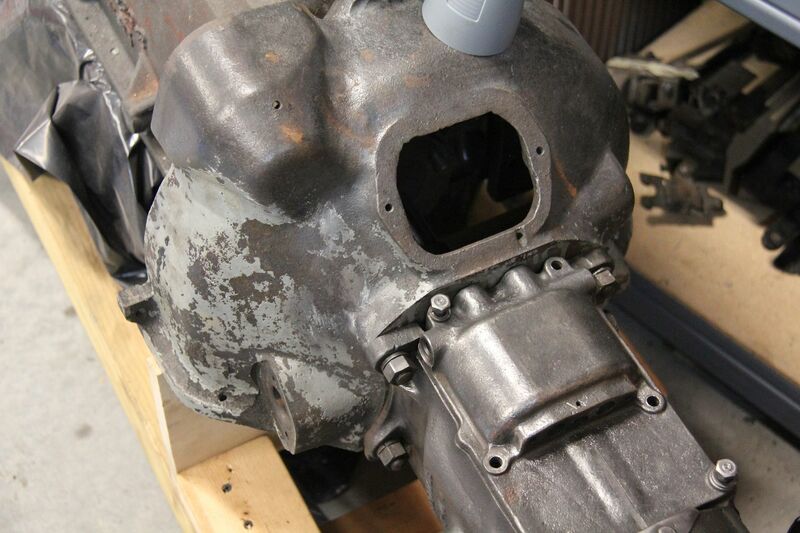 You can see some of the original paint on the bellhousing. 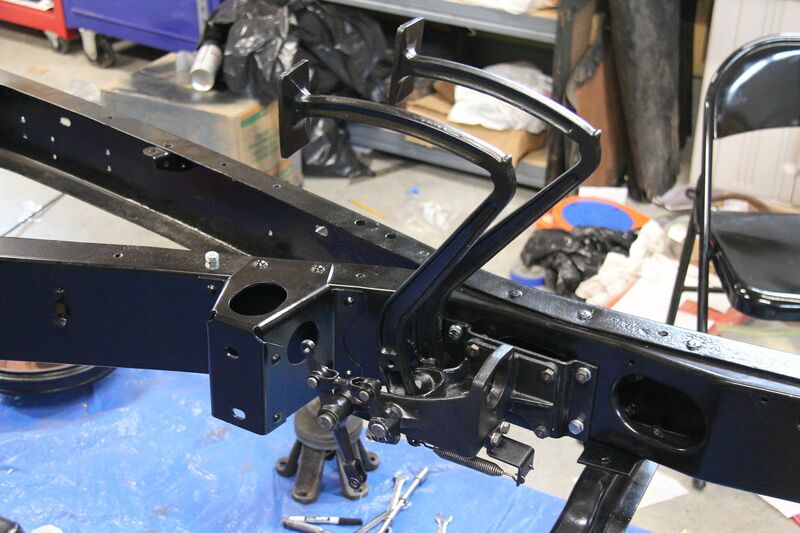 The front and rear brackets will also be gray. 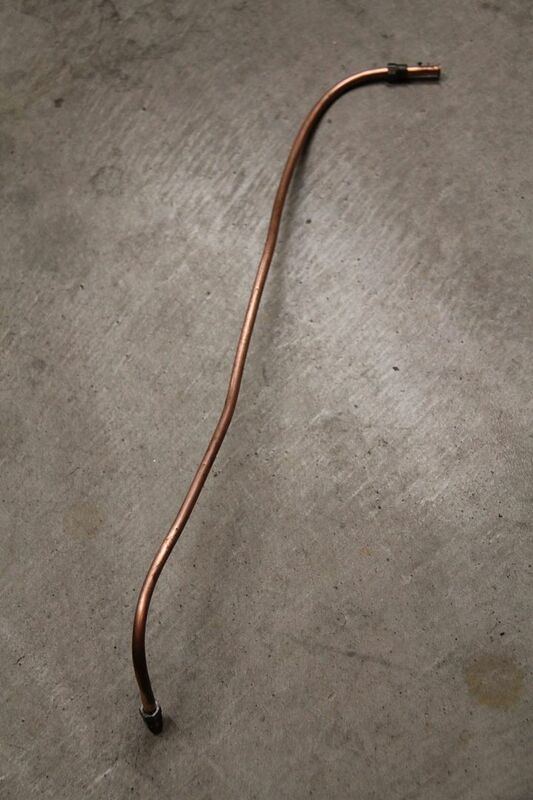 At one time or another some of the brake lines on my car were replaced. There is a mixture of single and double flared ends on the lines. 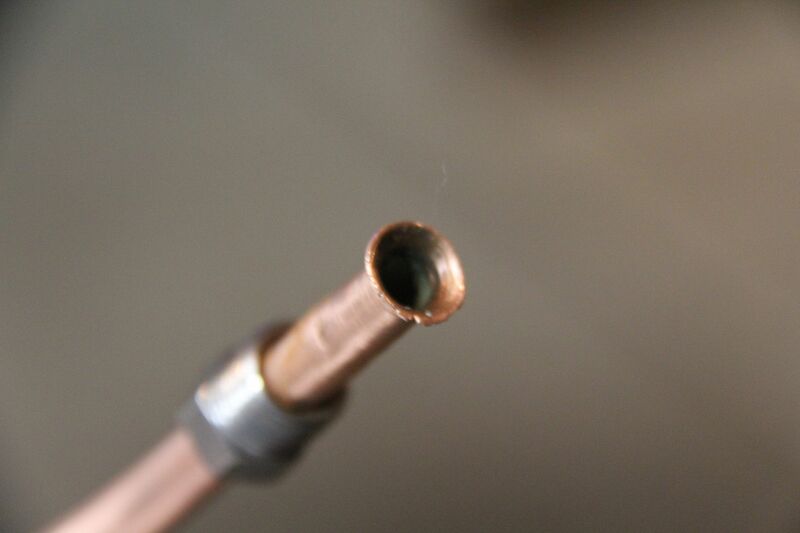 On examining the large line that goes from the master cylinder to the distribution block, I was surprised to discover that this line (bigger than the 1/4 inch line on the rest of the system) is make of copper, not the copper coated steel line found on the rest of the car. 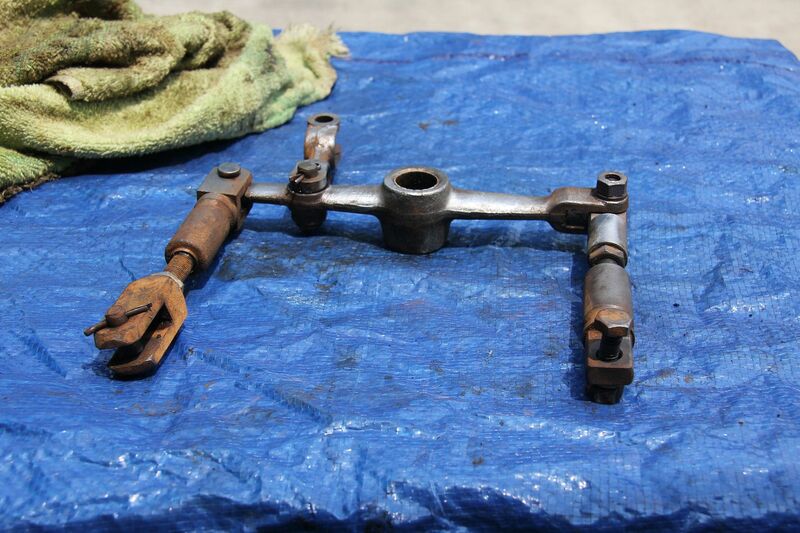 I assume it is original or very old, since it has single flares for the fittings. I'm going to try and find some Cunifer line of this size to match the other new lines I'm installing, hopefully not in the 25 foot rolls it usually comes in as I only need about two feet of the stuff. Just waiting for my resleeved master cylinder and brake cylinders to arrive to get the brakes done. 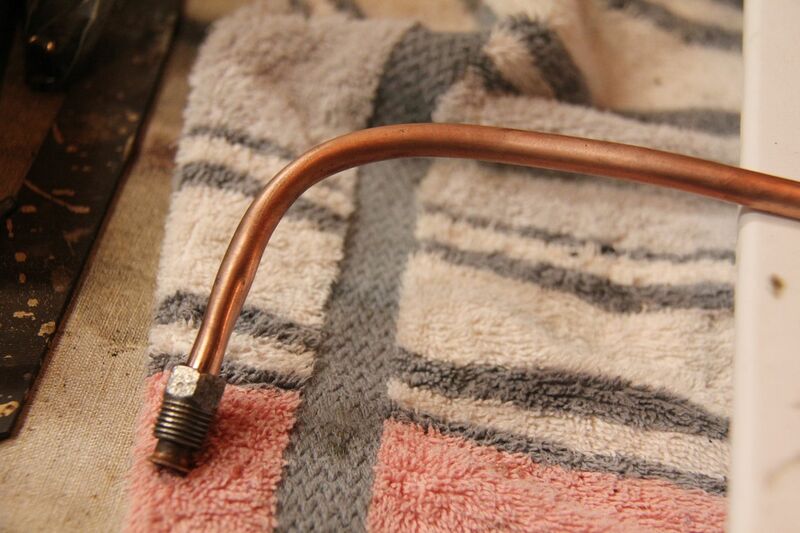 The brake pedal/master cylinder bracket is ready and waiting. That pedal assembly looks great! 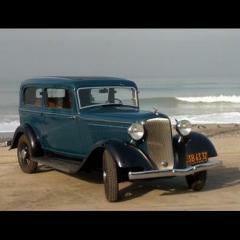 I am glad my '31 has fewer gadgets attached to it. What a big difference in some of the engineering Dodge made between the two years. It may have something to do with the vacuum clutch, although mine was removed long before I ever bought the car the first time back in 1965. At least I know it works in it's current configuration. That rear bracket and rubber mount is way different, too. Does yours have the two mounts between the bellhousing extensions and the frame? You can see in the photos of the motor/transmission that my belhousing has no extensions and is not attached to the frame at all. 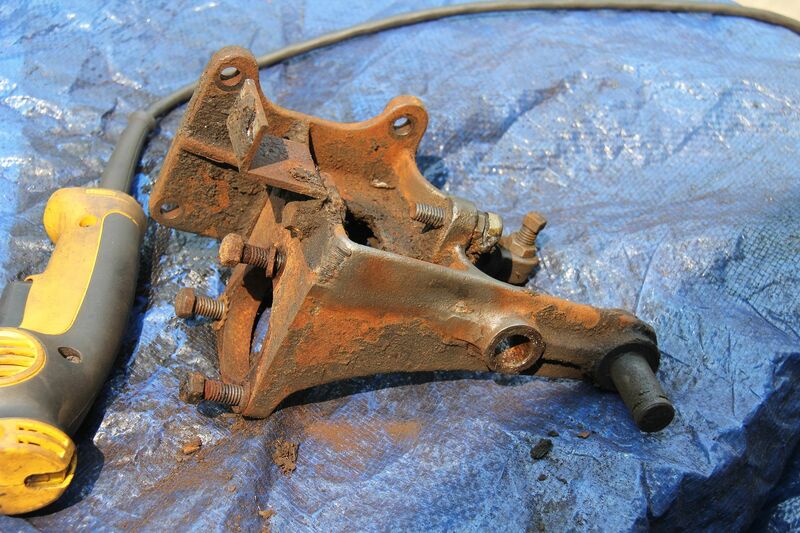 The three things attaching the motor to the frame on my car are the front bracket (with a rubber mount between the bracket and the motor), the rear bracket (with a rubber mount between the bracket and the transmission housing) and the small leaf spring that attaches between the bottom of the bellhousing and the rubber mount on the side of the frame. It truly is floating as in Floating Power. 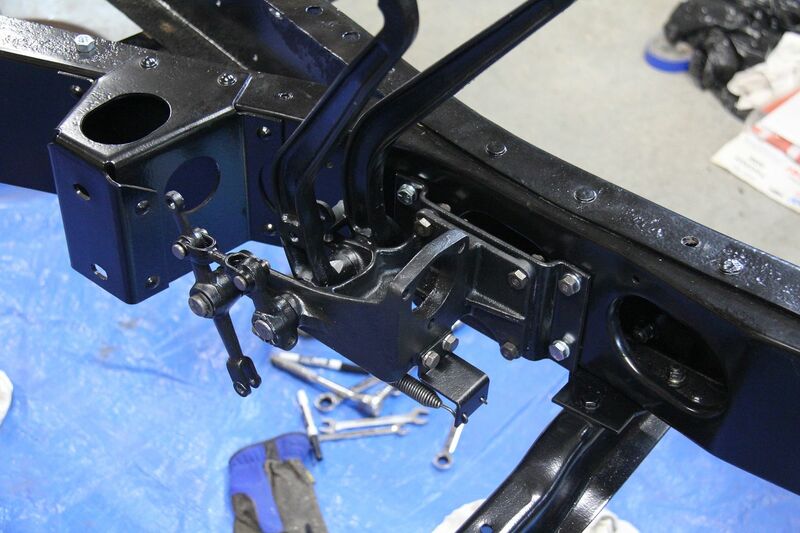 The fact that the pedal bracket is mounted to the frame and the bellhousing is moving on the rubber mounts may also explain the complicated clutch mechanism. Perhaps the lever system allows positive contact with the always moving engine/transmission. 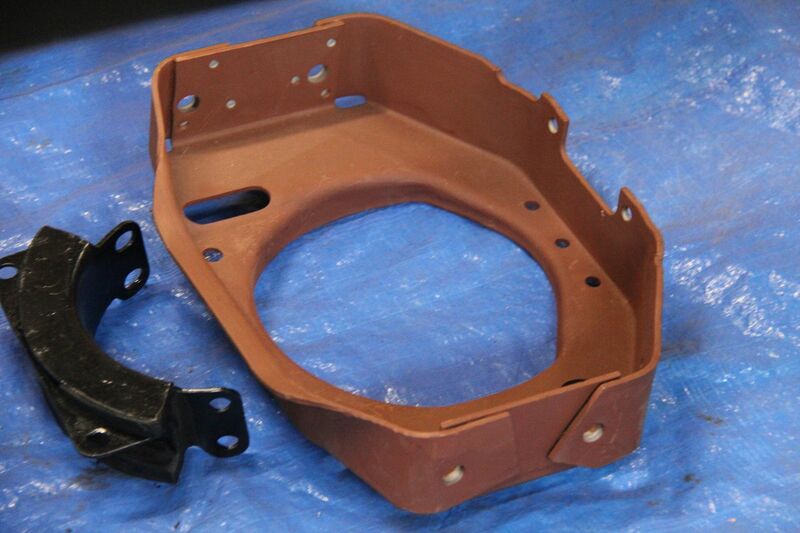 Mine has the rubber mounts on the bellhousing ears to frame and the front hoop to engine mount.